Gary George Larner passed away in the early hours of April 14, 2019 at the age of 78, ​but his larger-than-life persona and indomitable spirit will not be forgotten. 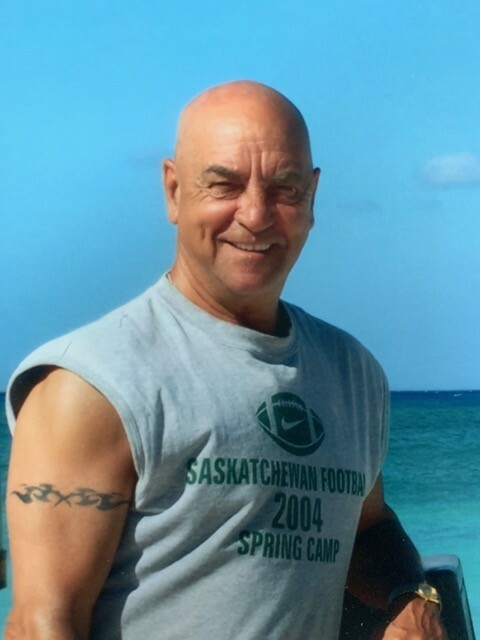 ​A long time citizen of Saskatoon, Gary was born in Winnipeg, but crisscrossed this country, and touched the hearts, of those who were fortunate enough to call him husband, father, grandfather, brother, uncle, friend, neighbour, co-worker, coach, or pal. Gary was loved by many, but was especially treasured by his beloved family. In this life, he was blessed to be loved not once, but twice, by two very special ladies. Shirley who loved him through his years of service to Lennox Industries, the Pow City Kinsmen service club, and the Evan Hardy football program. Their love produced two devoted children, daughter Shelly-Lynne (Ryan, Emma, and their father Jason) and son Derek (Miho and daughter Julia). Maryke “Myke” who shared with him, several years of volunteer service to the Saskatchewan Huskies football program. Their life was filled with many special memories, none more than their time spent together at the Willows Golf Course. Life with Myke also brought the love of her family, son Jason Smith (Margo Campbell, their sons Keesan and Colwen) and daughter Bobbi Oldridge (Thomas Cam and daughter Sophie Oldridge). Gary grew up with a loving set of siblings (brothers Edward and Ron), and his beloved sister Dianna (Carmen, son Gary, granddaughters Alexis and Stefanie), with whom he shared a special bond. Gary was a scratch golfer, known for his trademark smirk and quick wit. His sincerity and charismatic delivery made him stand out in every crowd. He will be remembered by so many, for a variety of reasons, but most importantly for his ability to put people at ease, and make them feel appreciated and respected. An athlete who excelled at football, hockey, and golf, Gary was a team player in every sense of the word. To know that he had your back on the field, and in life, was a gift he shared with so many friends and acquaintances; both young and old. At Gary’s request, the family has chosen not to have a funeral service. In lieu of flowers, the family requests that any donations be made in Gary’s memory to the St. Paul’s Hospital Foundation or the Saskatoon Cancer Clinic. At this time, the family would like to extend their gratitude and love, to all the doctors, nurses, paramedics, homecare providers, Palliative Care staff, and family friends, who have shown such tremendous kindness and love. We will always be grateful to the wonderful caregivers, who helped ease Dad’s pain and allowed him to pass from this life, into the next, with such dignity and grace. Arrangements in care of Chelsea Krentz – Mourning Glory Funeral Services (306) 978-5200.